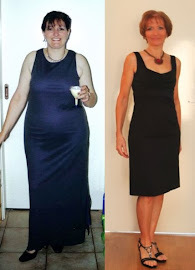 FitBody Fifty: Got a "Plan B"? After a worrying and disrupted couple of days, I went into the office yesterday, set up my laptop, put my lunch and snacks in the fridge, made a cup of green tea and sat down to read my emails. And found a message reminding me that we had a team lunch booked for that day. Damn! Forgot all about that. I hadn't planned for it. The old me might have had a freak-out. Eeeek! Lunch out? At a restaurant? What am I going to eat? What if there's nothing suitable on the menu? I know better now....I just shrugged, figured my home-made lunch could stay in the fridge for tomorrow, and that there'd be something I'd be happy with on the menu, and looked forward to some time away from the office. The restaurant was mostly Italian - pastas, woodfired pizza, chicken parm and so on. But I spotted something that took my fancy: Scotch fillet, served on a bed of garlic mashed potato, with some onion and a little red wine jus. Mmm.... I knew this was one of those places where you have to order veggies on the side, so I added a garden salad to my order. It was delicious - the steak was a bit on the huge side, the mash was an enormous portion, but other than that it wasn't a bad choice. So I ate about a third of the mash and all the salad....then the steak was so good I ended up finishing it. :p I drank water (still sticking to my "no wine" rule), skipped dessert and had a black coffee - I was quite satisfied anyway, in fact I was probably a little fuller than I usually like to be. Then I did a bit of compensating with the rest of my food for the day, because I had less calories left than usual, my protein was getting close to quota and carbs were well down. I skipped my afternoon snack, mainly because lunch was late and I just wasn't hungry untill dinner. Dinner was a Chinese pork dish, and I scaled back the meat portion, but had my usual amount of rice and veggies. Then after dinner I had a slice of raisin toast with a scraping of jam. Yum. In the end, calories came out fine, ratios were a little off, but nothing drastic. Balancing the unexpected or out of the ordinary is possible, even when you're aiming to lose weight. And if you don't get it just right, so what? You haven't "ruined everything" or "blown it completely" with one meal, as people often believe. And tomorrow's a whole new day. Actually, Skwigg wrote a great post about blowing it (or more accurately, NOT blowing it) and the importance of getting a mental grip. Go read it. That's the reason I love, love,love the cheat meal. One blow out can become a cheat meal and there is no guilt attached. Actually I'm totally over the guilt thing these days. I went out for dinner on Saturday night and had a rocket salad (which was exactly the same as the one you have in your food blog) with snapper. I felt so smug about my food choices I nearly got out the gold stars for my forehead. Now I'm just going to have to work on the 'no wine' situation to get it just right.